Majora’s Mask is known more for than just its unique gameplay features and dark tone and atmosphere. The game has recieved a significant amount of attention from fans due its distinctive aesthetic flair, namely through the main antagonist in the game, Majora’s Mask. The floating, sentient and destructive artefact is no doubt of an intriguing design, separating itself from the typical hoi polloi of Zelda enemies through its unexplained motives for destruction and seemingly psychological games and tricks, especially evident towards the end of the game. However, a reddit user by the name of Khmelic has taken the design of Majora’s Mask one step further to put a modern twist on the well-known design. Hit the jump to find out more! 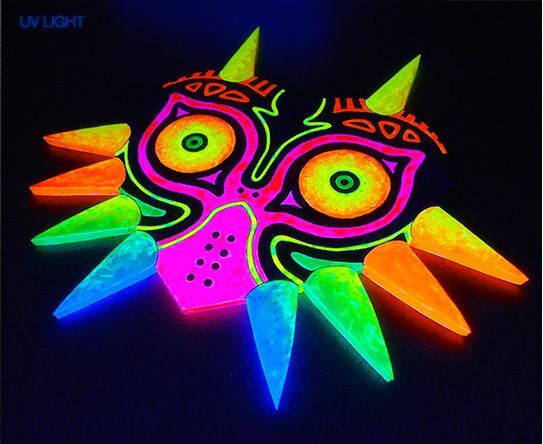 As you can see, Khmelic has incorporated glow-in-the-dark paint to give the mask a neon look when under UV light, bringing to mind the typically retro and fluorescent designs usually associated with the 70s. 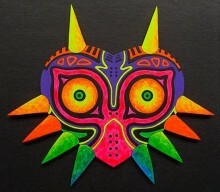 The lack of glow-in-the-dark paint on parts of the mask also accentuate some of the more subtle design features, such as the red tribal patterns above the eyes and the green lines surrounding parts of the mask which also appear to frame the eyes. Perhaps as a result of this, the eyes themselves seem to pop out of the mask, creating a very intriguing effect not seen in the game or on official art. Unfortunately, this mask is currently the only one of its kind and is not available to purchase, but Khmelic on the comments section of his reddit page has touched upon the possibility of opening an Etsy account to sell these masks commercially. We’ll keep you posted if he does eventually put these up for sale. UPDATED CST 14:10, 03/24/13: It has transpired that the mask is now up for sale on Etsy for $140 CAD ($136 USD). You can order the mask, handmade, from Khmelic here. But what do you think? Do you think this is an improvement on the normal design in-game? Would you purchase one for yourself? Tell us in the comments below!